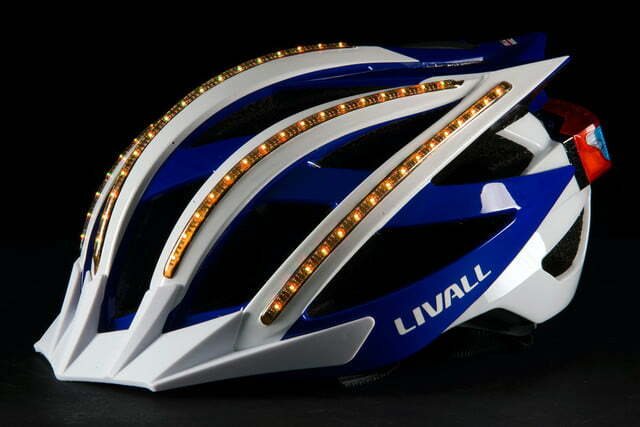 Loud and proud, the Livall Bling boldly blazes where no bike helmet has gone before, if you can shirk the smirks of onlookers and handle the weight. 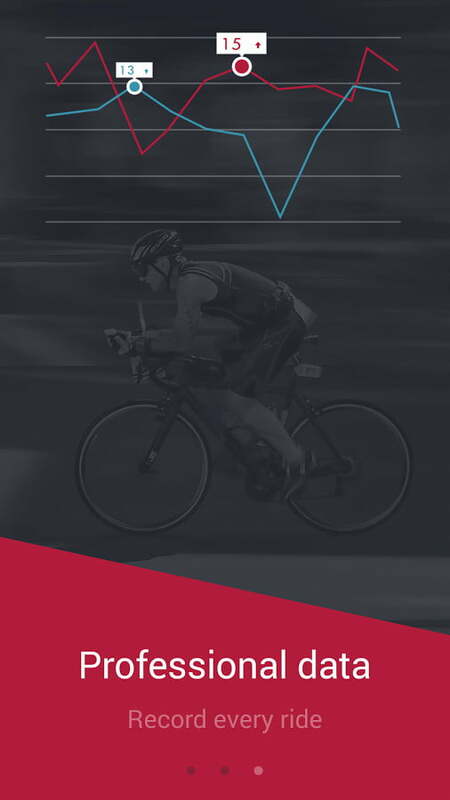 The race to connect cyclists and their gear seems to have cut a detour around helmets. What’s up with the clown hat? 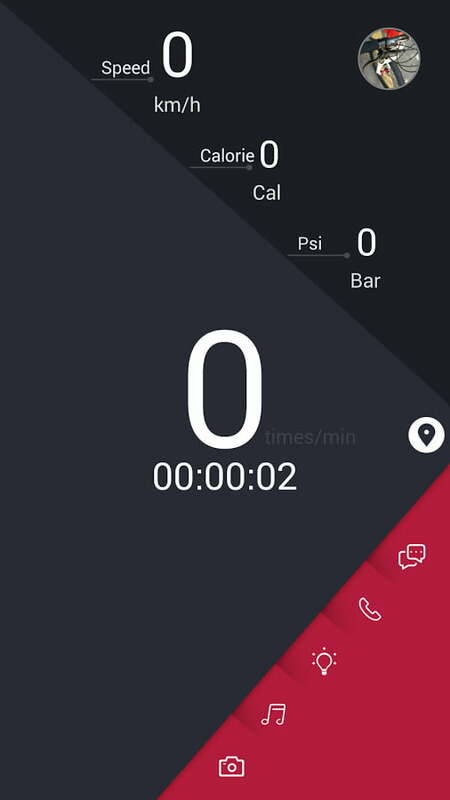 You can buy heart-rate monitors worn on the chest, cadence sensors on the cranks, and even power meters built into hubs and pedals, but not much has been done to bring helmets into the connected app world. 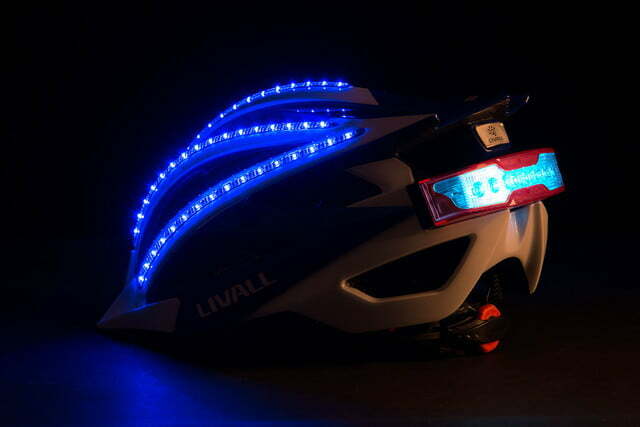 China-based Livall wants to change that with the Bling, a connected helmet that adds lights, turn signals, Bluetooth speakers, and even a microphone for taking calls. 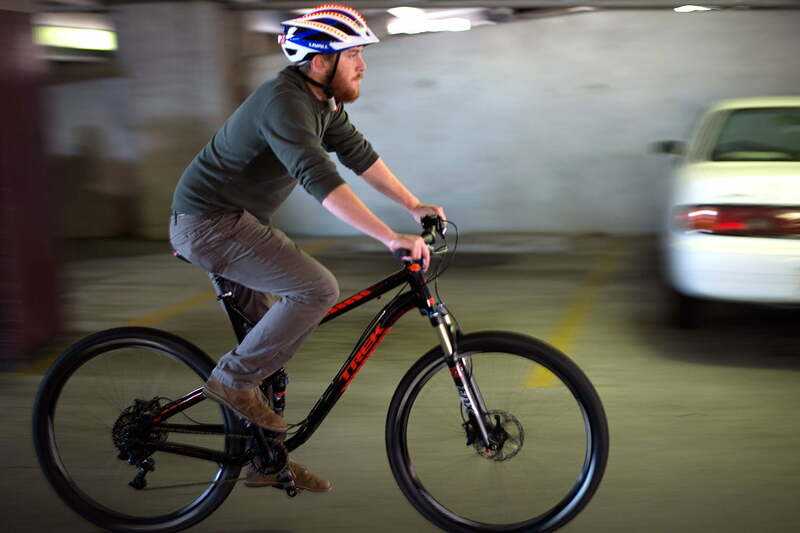 But does it add up to a safer helmet, or a novel distraction? With 80 LEDs scattered across its EPS foam and plastic shell, the Bling is appropriately named; this is a helmet that will get you noticed. 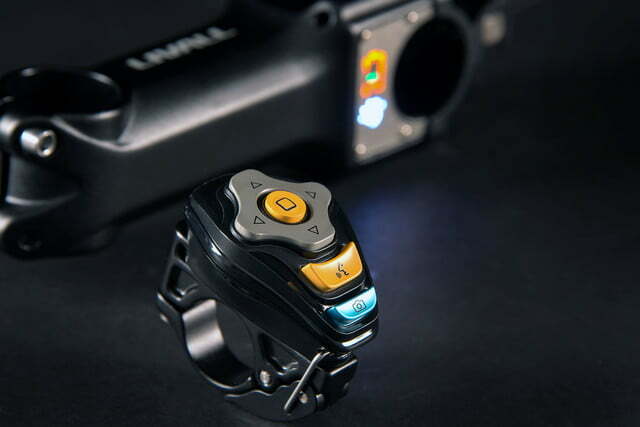 Eight of them on the back double as turn signals when paired with Livall’s handlebar mounted Jet Bluetooth remote. 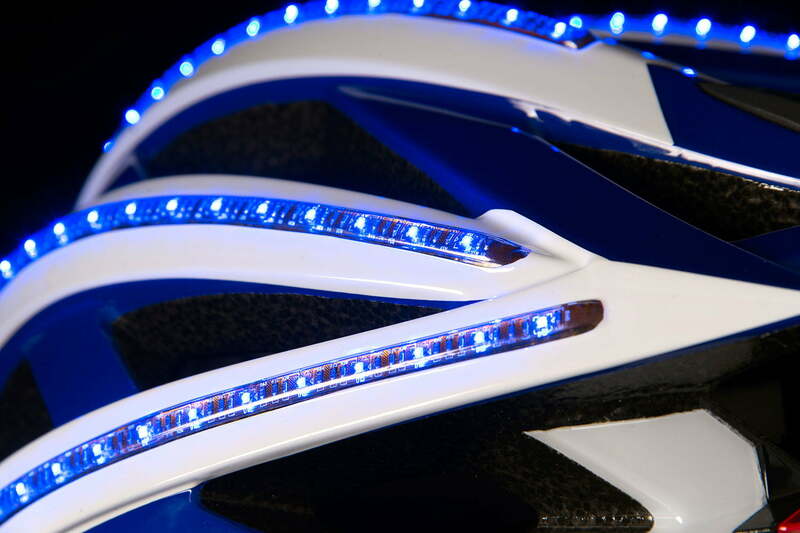 Five rows of LED lights up top pulse through different colors, making the helmet look like a miniature airport runway lit up at night. Then there’s the audio bling. Stereo Bluetooth speakers built into the helmet directly above the ears allow a rider to listen to music without blocking out ambient sound. 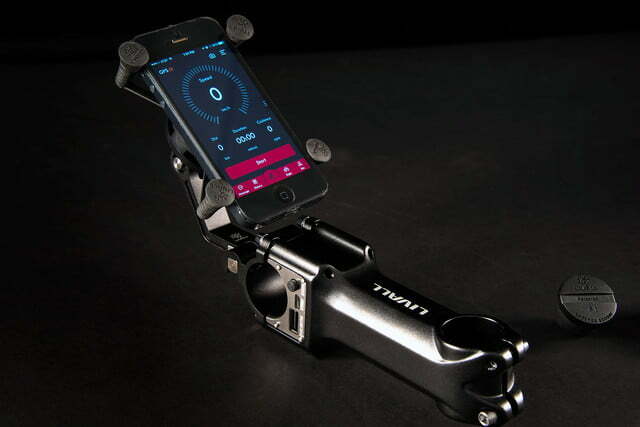 A wind-proof mic allows a cyclist to take phone calls while riding. The mic also works in “walkie-talkie” mode when other Bling helmets are nearby. 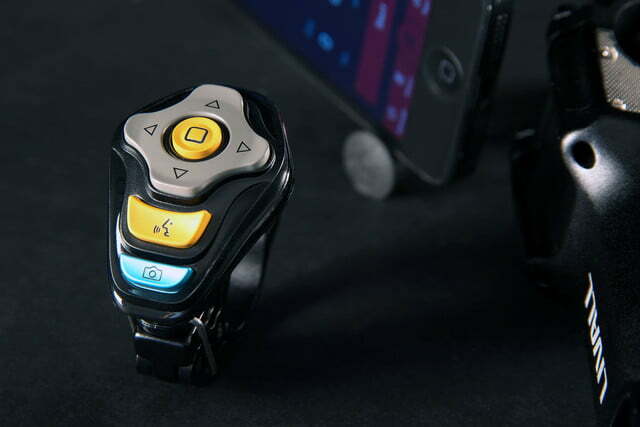 For extra safety, the Bling includes an accelerometer that will trigger an email to friends and family in the event of a crash. 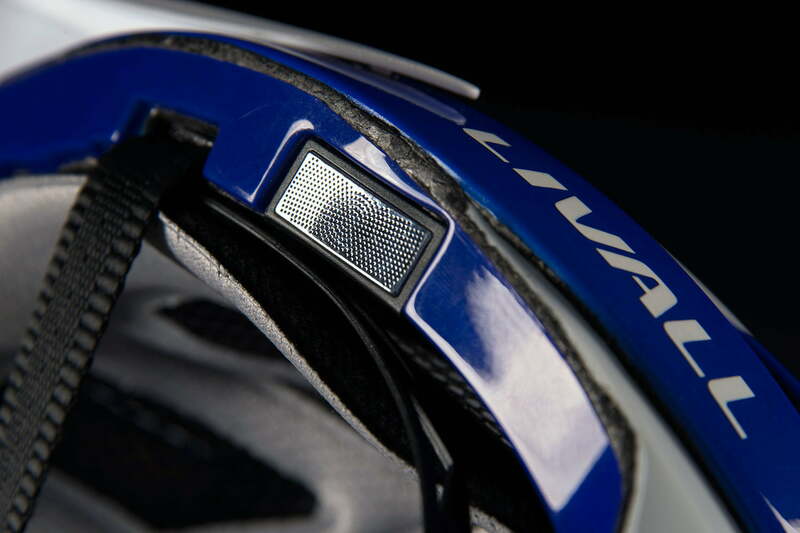 A button pad located directly below the visor lets you control these onboard functions on the fly. There’s a function button in the middle, and left and right selection buttons that help when scrolling through a menu or adjusting the volume. While some of the features are interesting, all of them together in one helmet can be a bit overwhelming. 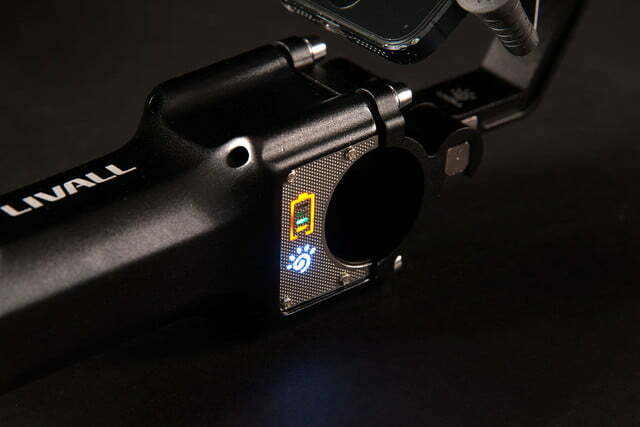 A handlebar mountable remote control called the Bling Jet lets you control the functions of the helmet from the bars, and even take pictures on a compatible connected phone. 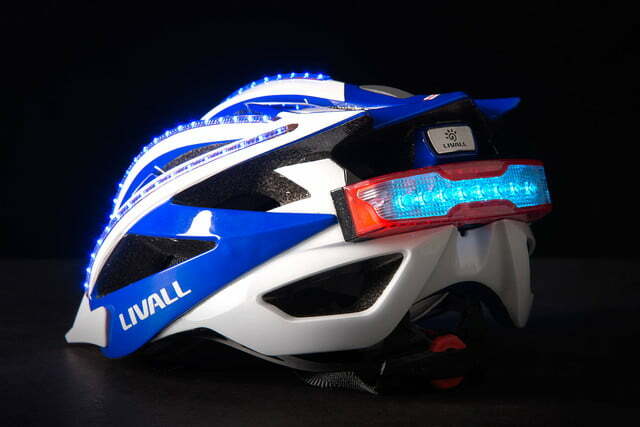 With this much built in tech, we expected the Bling to be ugly, but Livall designers have done a smooth job of packing all the tech into a helmet that (ignoring the flashing lights) looks very much like a regular commuter helmet. It features an adjustable chin strap, and a dial in the back which can be tightened or loosened to finely tune the Bling’s fit. 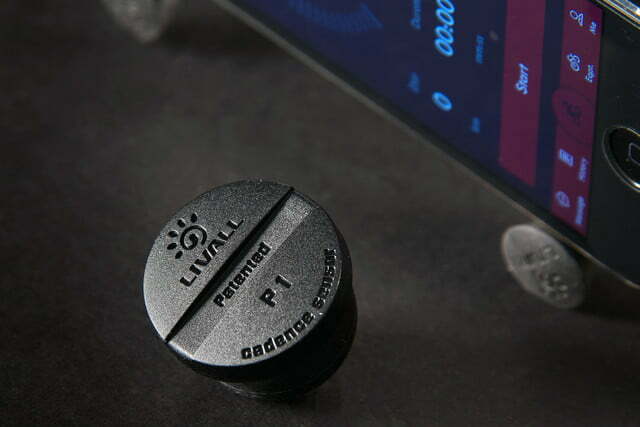 The Livall Bling Helmet we tested arrived with the helmet, the Jet handlebar mountable Bluetooth remote, a Bluetooth cadence sensor, and a USB charging cable. The Livall Blings is what we like to call a “what-if” product. It’s as if the designers sat down and listed all the things anyone ever wanted in a connected helmet and if the technology exists, they put it in. While some of the features are interesting, all of them together in one helmet can be a bit overwhelming. 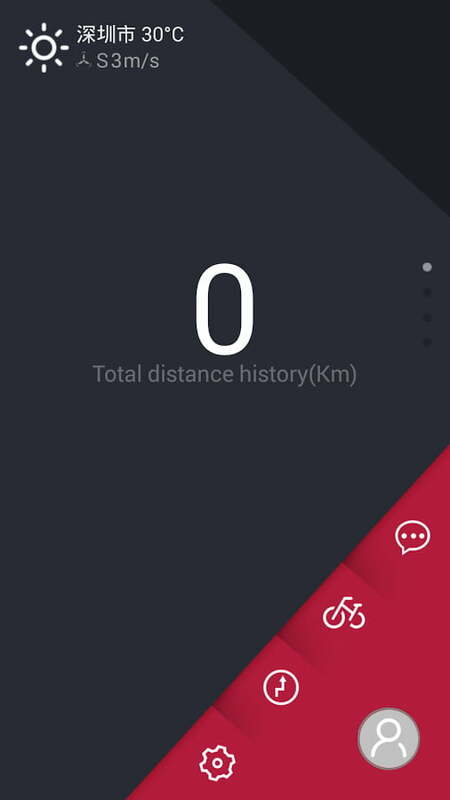 Getting the helmet running requires downloading Livall’s Riding app, available for free on Android and iOS. After signing up, we paired the Bling with our phone, powered it up and strapped it to our heads. “What’s up with the clown hat?” a friend asked the first time he saw the helmet. “Yeah, it looks like there’s a circus on top of your head,” he said, chuckling. He wasn’t wrong. 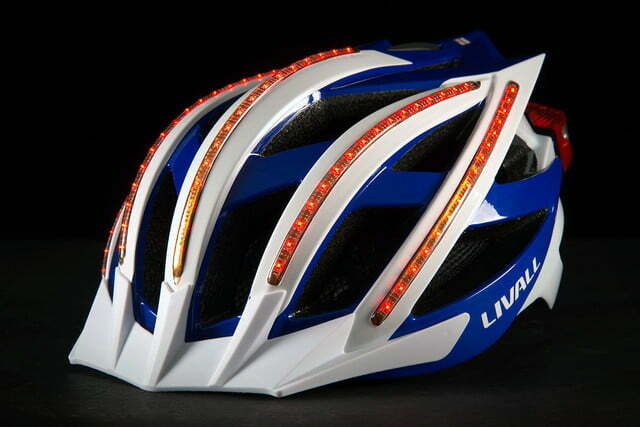 While being visible out on the road has its upsides, the sheer visual loudness of the lights flashing all over the top of the Bling would be enough to embarrass many cyclists. Reactions on our first ride ranged from smirks to open laughter. It’s great that this helmet will get you noticed, but you had better be prepared for the attention. Listening to music without blocking ambient traffic noise with headphones was a treat … when we were going slow. The speakers worked well and we were still able to hear cars approaching, horns honking, and people talking as they passed. At any speed over 18 miles an hour, however, wind noise makes it difficult to hear much detail from the music. The visor-mounted buttons made it easy to adjust the volume, skip tracks, and even answer the phone. The mic worked well while we were stopped (we wouldn’t suggest taking calls while riding). Not surprisingly, the Livall Bling has a bit of a weight problem. 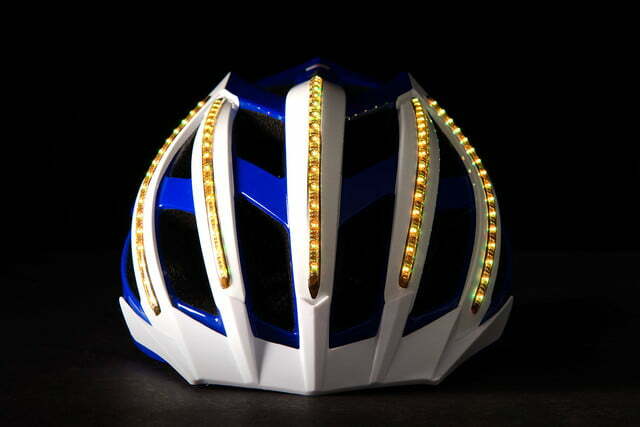 At 1.13 pounds, the Bling is twice as heavy as most performance cycling helmets. The weight of a helmet may not matter much to someone who is only wearing it on a 10-minute ride to the store on a city bike, but for those who commute 45 minutes to work, or regularly hit 50 miles on training ride, the helmet can be downright oppressive. After about 25 minutes in the Bling, we began to feel a strain on our neck that soon turned into throbbing pain. It wasn’t that the helmet was out of balance — the designers have done a great job of balancing the weight — it’s simply that the helmet is too heavy. 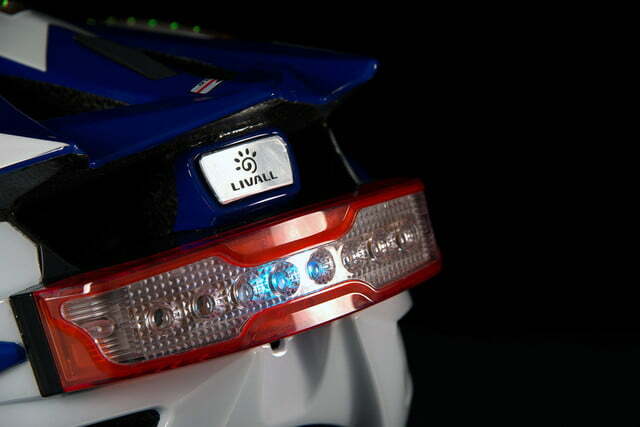 With built-in Bluetooth speakers, 80 LEDs, turn signals, and automatic crash detection, no other helmet even comes close in functionality to the Livall Bling. If you don’t mind having “a circus on your head,” you’re undeniably more visible with the Bling on full blast, and being able to hear traffic over your music will keep you safer, too. 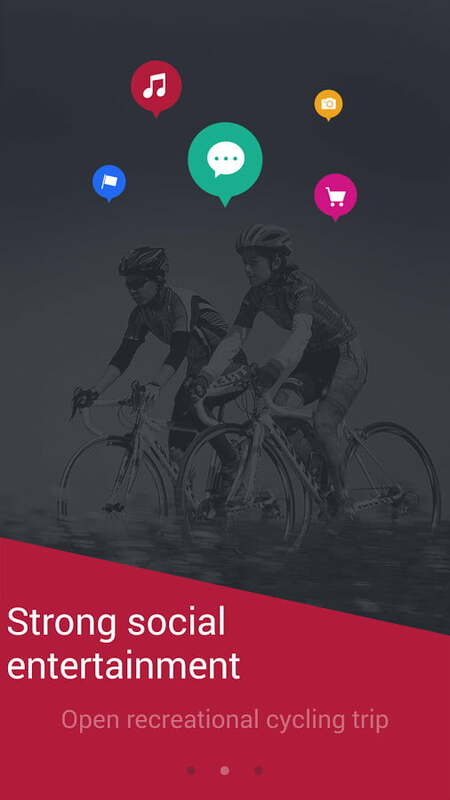 But if your plans include longer rides, you’ll find the Bling is simply too heavy for serious cycling. 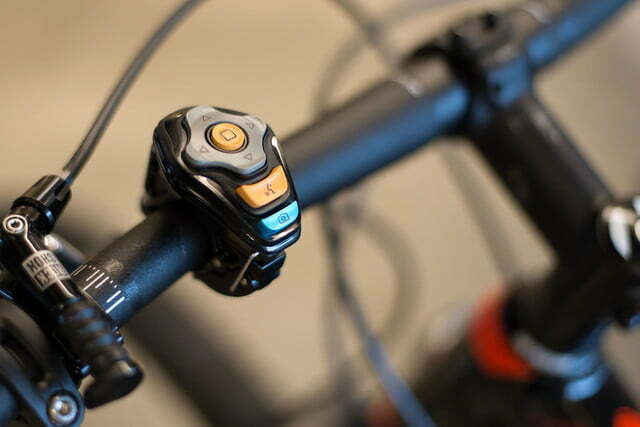 If you just want music and better visibility while you pile on the miles, a pair of earbuds and a little blinky light on your favorite helmet might be the best option. 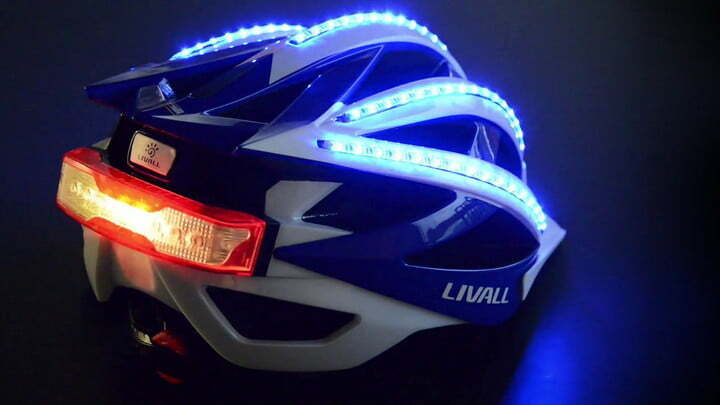 The Bling helmet will retail for $277 in October, however, Livall’s fundraising page on Indigogo still has a few available for $100 (including the Jet remote and Cadence sensor).